Yesterday, ComicBook.com reported on an Instagram post from Arrow actor David Ramsey, in which he posed near a writers' room door and teased the possibility of a crossover with The Flash. Today, we have confirmed that, yes, Ramsey and his onscreen wife, The Walking Dead's Audrey Marie Anderson, are headed to The Flash for a one-episode crossover. The story will take place in the upcoming, fifteenth episode of The Flash. "The Diggles arrive in Central City to help Barry take on King Shark who has escaped from ARGUS and is hellbent on completing his mission of destroying The Flash," showrunner Andrew Kreisberg told ComicBook.com. 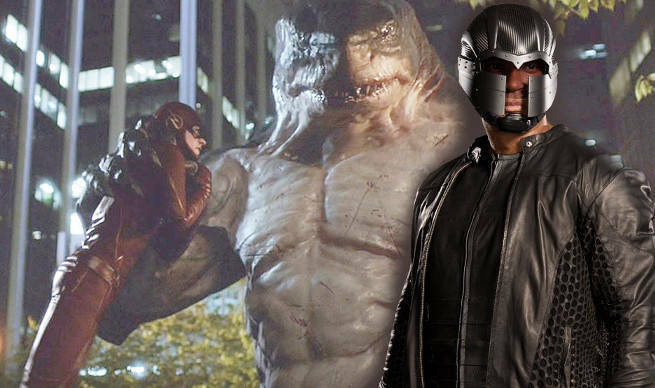 Some of our readers had speculated that Diggle might head to Central City to chase down the villain, following King Shark's defeat at the hands of Harrison Wells earlier this season on The Flash. During that appearance, of course, King Shark appeared for a glorified cameo, which producers called "a very expensive thirty-five seconds" at the time. King Shark, for those not in the know, is a humanoid shark-man. In the pre-Flashpoint continuity he resembled a Great White, as seen on The Flash, but more recently in the comics he's been depicted as a mutated hammerhead shark. Originally a Superboy villain, he was implied to have been descended from the Wild Men of Kamandi fame (his creator, Karl Kesel, was a big Jack Kirby fan). He would later go on to trouble everyone from Jimmy Olsen to Aquaman, and has served stints in the A.R.G.U.S.-backed Suicide Squad and the Secret Six. King Shark was rumored to be one of the characters in the Suicide Squad movie for a time. "It was just fun for us, because obviously we can't afford to do an entire King Shark episode, so the idea that he's one of Zoom's minions," Kreisberg said back then. "He said, 'Zoom sent me here to kill you.' He's just the latest in another line, which does mean that there is a King Shark on Earth-1, now that we've designed him." About a month later, they changed their mind about how obvious that was, and confirmed that King Shark would return for another episode in Season Two. The Flash returns with new episodes on January 19 at 8 p.m. ET/PT on The CW.